Stripe Pattern Picnic cooler bag with service for two. Great for Family outings or romantic getaways. 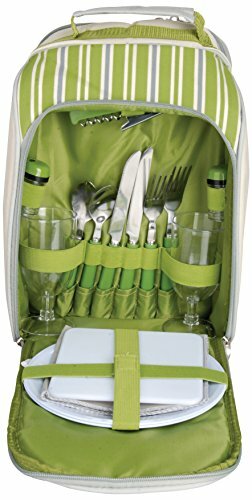 Insulated Cooler Backpack Lunch Bag | Lightweight Water Resistant With Large area for portable storage | Free Wine Cooler and 2 Foam Ice Packs. Great for Hiking, Sports, Travel, Camping, Day Picnics.